racersauctions has no other items for sale. Item all good thank you seller. Works great! But not sure it is needed. 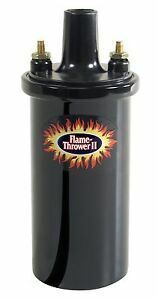 I bought the Flame Thrower distributor with the Ignitor II. I bought the coil to work with it for "best results". The distributor came first and in the instructions it said I could use it with any coil with 45 ohms or less. So, I installed the distributor first. Wow! What a difference! Smooth idle! Fast starts! More power! Then I installed this coil. Meh... Didnt notice any difference. Also, the paint scratches off very easily, so be carefull installing it. Found after I ordered that I had ordered the wrong coil (within 3 minutes). Called and they were able to change my order without delaying shipment. Received on time and installation instructions were accurate. Using on a 1960 Ford tractor which had been converted from 6 volt to 12 volt. Works great. Deffinitly 5 stars. it took me several years to install the Pertronix setup i was happy with the old point setup, but after research and lots of thought i decided to make the swap and i would not go back to point ignition what a difference especially smoother idol. First off, I am not using this in an automobile. It was purchased to use in a high voltage induction coil for a physics demonstrations. I use a 12 volt relay as a driver. I have made a number of induction coils using automobile ignition coils and from that experience I can say that this Flame Thrower ignition coil gives a noticeable stronger and longer spark than any of the other coils I have used. I am very happy with the performance and results I have gotten with this coil.